What is cuter than an adorable little one in custom-made Halloween outfit? Not a costume, mind you, but an actual outfit that can be worn more than once! I will likely whip out a Halloween costume this weekend, but I won’t spend too much time on it. If we can wrangle the no-is-my-favorite-word toddler into wearing a costume at all it will be a small miracle, so I am not spending much of my sewing time on that chore. But a cute Halloween jumper that I can embellish? I’m all over it. 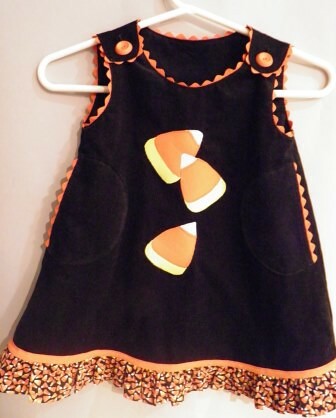 My DD loved a dress on Pinterest that featured a candy corn appliqué, so that element became the design focus. 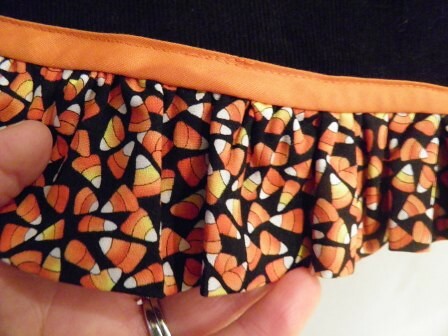 How did I manage to have some candy corn print cotton in my stash? 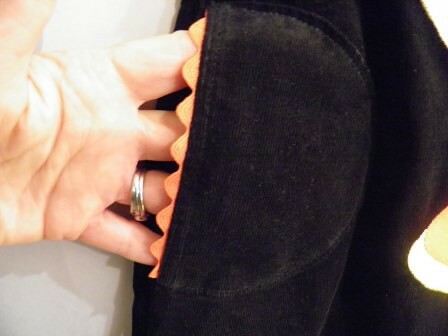 That became a ruffle at the hem edge. I wrapped the seam allowance in orange bias binding so there are no raw edges. I know. Overkill for a child’s dress. I bought some yellow and orange rick rack, and decided that looked best sandwiched in the seam allowance. Of course. I couldn’t just slap it on top, right? 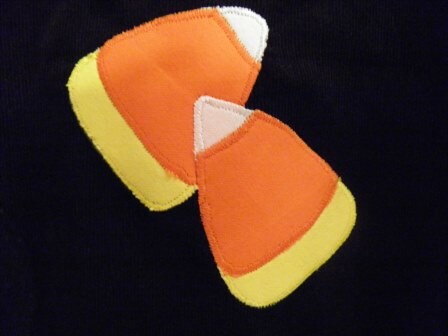 Just to top off the craziness, I added 3 candy corn appliqués to the front of the jumper. Which of course means a multiple thread changes to accomplish white, yellow and orange stitching in the appropriate places on each applique. Just shows how far you will really go for a grand-daughter. McCall’s 6193 is a very simple pattern, and the perfect foil for an embellished garment like this Halloween jumper. I have no idea if the instructions are any good, since I never opened them. If you are not a nut like me, I would imagine you could whip one of these out in a few hours. But if anyone knows how to complicate a simple sewing task, I am a top candidate for that honor! I REALLLLLLLY hope my DGD deigns to wear this outfit. More than once. For the rest of you, you still have a few days left. Get on it and whip out some cute Halloween baby clothes, and then share a picture of your creations! Pants! Is there anything harder to fit than pants? Easy to sew, hard to fit properly. I did lengthen the legs by 2 inches, because my legs-that-really-belong-to-a-six-footer ALWAYS require that I add a few inches to my skirts and pants. Always. Oh, and I also added about 1/4 inch to the back crotch point length, because you cannot add that alteration after-the-fact, and my ever-so-slightly-chunky-thighs often need a touch more room than most pants patterns allow. So shoot me, I did make a couple of eensy-weensy pattern changes. For my test pair I used a beefy stretch knit – think heavy Ponte weight fabric. Despite the fact that the pattern name says stretch woven, the fabric sample Style Arc attaches to their patterns is clearly a stretch knit. I used this fabric because I am in stash-bustin’ mode, and I wasn’t going to cry if they didn’t work out. Low bar, eh? These pants stitched up in a flash. They really are a project that can be completed in an afternoon. A seam down the center front for a little visual interest, a dart up the bottom of the back leg for shaping, a few darts at the waist, an invisible zip and a facing and DONE! After a quick try-on I determined that all women in Australia are clearly over six feet tall, since the extra 2 inches I had added were totally unnecessary. First clue that this pattern was drafted entirely differently than U.S. counterparts (or is that counterPANTS? hehe). Waist fit was good, the front looked perfect, so I checked the dreaded rearview in the mirror last. Amazingly, a few smiles under the seat were the only thing off in the fit. A quick scoop of the back crotch fixed that problem, and my pants FIT! This was confirmed by my ASG sewing buddies at the retreat last weekend, and trust me, they are a tough crowd to please. So there you have it. 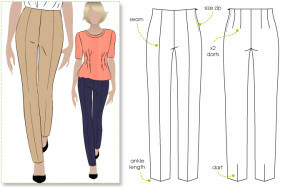 A smidge more length added to the back crotch point and a small scoop of the back crotch, and voilà – PANTS THAT FIT. Those designers down under know how to rock the pants patterns! Sewing is not a cheap hobby. Anyone who thinks they will save money sewing, ummm, hasn’t actually started sewing yet. Oh, one more thing. Craftsy is also sponsoring their first ever blogger awards! I am such a joiner I totally want in! So, dear readers, if you would consider nominating my blog for “Best Tutorials” over at Craftsy.com I would REALLY, REALLY appreciate it. Thanks much!